AC Energy and BIM Group tapped RCBC as sole Lender to their maiden solar power project in Vietnam. 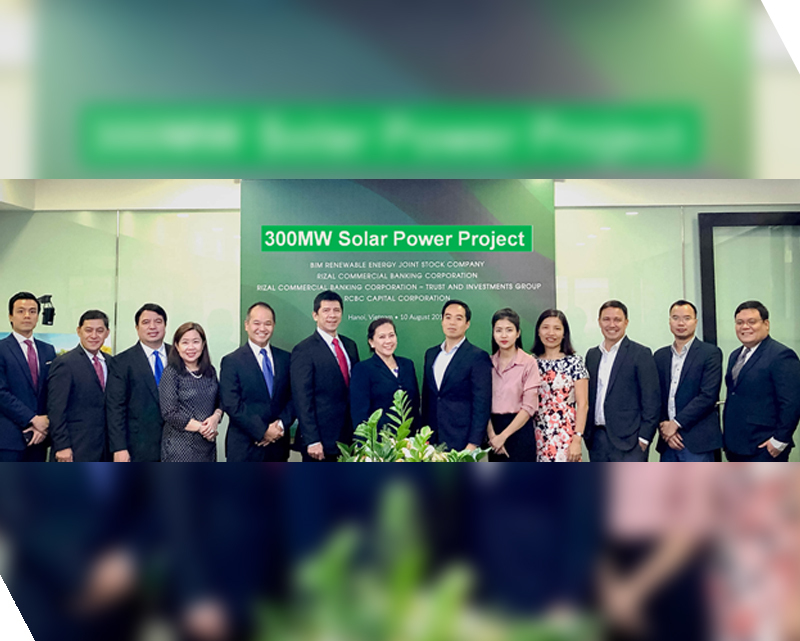 The 300MW Solar Power Project will be the largest solar power project in Southeast Asia. 13 August 2018 – AC Energy, Ayala Corporation’s business arm in the energy sector, in partnership with the BIM Group of Vietnam signed EPC and financing documents for the development of BIM Solar Power Plants in Ninh Thuan province, Vietnam. Early this year, the initial 30 MWp project broke ground. These contracts increase the solar farm size from 30 MWp to 280 MWp. The joint venture plans to further expand the capacity to well over 300 MWp. Once completed, the solar farm will become the largest in Southeast Asia. The project is expected to commence operations in time for the June 2019 solar feed in tariff deadline. “We are excited to scale up our development initiatives in Vietnam. We expect to build on this momentum and add more projects in the future” said Eric T. Francia, AC Energy’s President and CEO. The project is estimated to cost around USD 237M, which will be financed by debt and equity. AC Energy will participate with a 30% voting stake and approximately 50% economic share. BIM Group is a diversified corporation in Vietnam, successfully establishing its mark in four main business fields namely: Tourism Development & Real Estate Investment, Agriculture – Food, Commercial Services and Renewable Energy. BIM Group has a significant experience in business development in Ninh Thuan, the host province for the solar project.